On Monday evening, former Intelligence Community Inspector General Charles McCullough III told Fox News’ Catherine Herridge that the Clinton campaign warned it would fire him after discovering evidence of “top secret,” emails passing through Hillary Clinton’s private email server. “There was personal blowback. Personal blowback to me, to my family, to my office,” McCullough III told Fox News. McCullough told Fox News that then-Director of National Intelligence James Clapper was briefed on the findings and in turn was told by officials to keep the intelligence official out of the matter. Herridge: "Was there an effort to deliberately mislead the public about [@HillaryClinton] classified emails?" 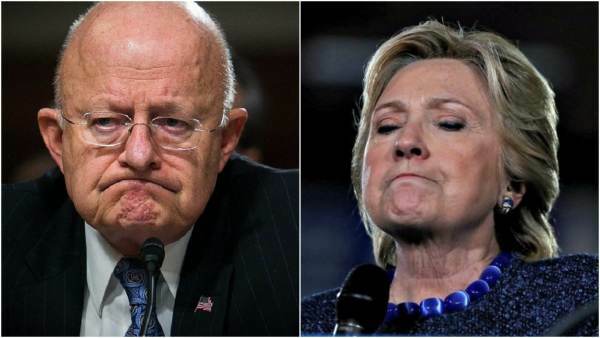 ..[T]he former inspector general, with responsibility for the 17 intelligence agencies, said the executive who recommended him to the Obama administration for the job – then-Director of National Intelligence James Clapper – was also disturbed by the independent Clinton email findings. “[Clapper] said, ‘This is extremely reckless.’ And he mentioned something about — the campaign … will have heartburn about that,” McCullough said. Despite concrete evidence of Clinton’s breaking the law, Clapper was shielded from the investigation. The former CIA director could have helped get the FBI’s house in order by briefing bureau officials on the seriousness of the evidence — but instead, did nothing. Clapper’s silence on the evidence he was presented more than suggests he is complicit in covering up Clinton’s wrongdoings. From the very start, the FBI’s investigation into Hillary Clinton’s private email use was flawed. As Gateway Pundit’s Jim Hoft reported last Friday, Rep. Matt Gaetz (R-FL) told Fox and Friends that Congress now has evidence Crooked cop James Comey and his FBI did not follow normal standards and gave Hillary Clinton “special status” in their investigation.